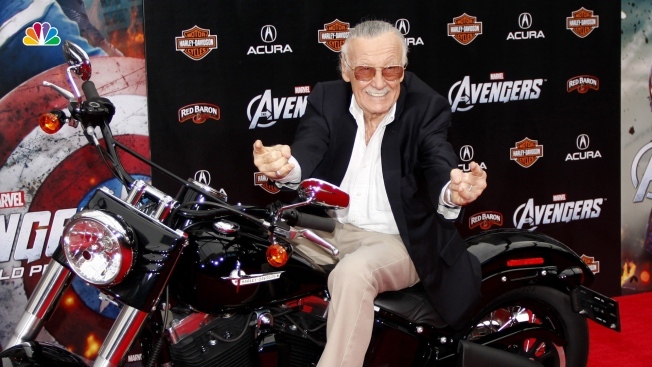 The private struggle over the care and legacy of Marvel mastermind Stan Lee played out in public Friday in a Los Angeles courtroom as attorneys working with his daughter shoved aside a previous lawyer and reasserted that they represent the 95-year-old Lee. They were granted an elder-abuse restraining order against a former manager of Lee, just as the previous attorney had done, but only after a judge heard arguments about who should speak for Lee. In the tiny courtroom packed with current and former attorneys and associates of Lee, lawyer Tom Lallas asked for a 30-day extension of the temporary restraining order he had received against Lee's former manager Keya Morgan. Lallas has said in legal documents and news releases in recent weeks that he was representing Lee. Superior Court Judge Pro Tem Ruth Kleman refused to consider the motion, saying it appeared Lallas was not employed by Lee. "I'm only concerned who has authority to represent Mr. Lee," Kleman said. Lee's daughter and only child, J.C. Lee, sat in court and smiled at her attorneys when the judge refused to recognize Lallas. Attorneys working with her had provided a signed declaration from Stan Lee denouncing Lallas. The hearing came on the anniversary of the death of Joan Lee, Stan Lee's wife of nearly 70 years, whose absence left a void that has resulted in a struggle between would-be friends, attorneys, advisers and managers of the man whose co-creations include Spider-Man, the Incredible Hulk and the rest of the Avengers. The latest Marvel film featuring his characters, "Ant-Man and The Wasp," was released Friday and is expected to top the weekend box office. The new restraining order against Morgan, a 42-year-old movie producer who had worked as Lee's manager and personal adviser, demands that he keep away from Lee, Lee's daughter and Lee's brother. The request for the order alleges that Morgan has attempted to interfere with Lee's ability to contact caregivers, doctors and family members, has attempted to alienate Lee from his daughter, and is embezzling or misappropriating $5 million worth of Lee's assets. Lee's new lawyers said they would also work with police and prosecutors in an elder-abuse investigation involving Morgan. Morgan told The Associated Press in a text message that he was in New York working on a film. He declined to comment further on the advice of his lawyer but has previously denied abusing Lee in any way. Morgan's lawyer Alex Kessel did not immediately reply to a request for comment on the allegations in the new order. Stan Lee's declaration said he had fired Lallas in February and had no desire to be further represented by him. It also said Morgan had likely committed malpractice by disclosing to media and others his opinions about Lee's health and personal life. It said that he had no desire for Lallas to file for a restraining order in his name. "Mr. Lallas has done enough damage already," the document says. "Hopefully, he will just stop." The document includes Lee's original request that Lallas be fired, signed, "Excelsior! Stan Lee." Lallas said outside court that he stood by his assertion that he could act on Lee's behalf, but he was glad at least that Lee's other attorneys were moving to keep Morgan away from him.